Heading outside? You probably have given serious thought as to which snacks to bring for yourself on your active excursions, but have you considered what to bring for your dog? Here are some things to keep in mind when packing for your journey, whether it’s a long neighborhood jog or a multi-day backpacking trip. 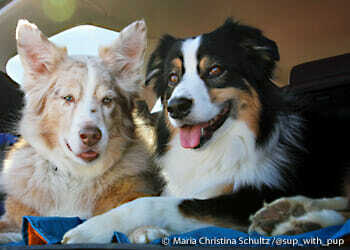 Daily protein requirements are higher in dogs that regularly engage in long-distance exercise. These building blocks of muscle help dogs rebuild fatigued muscle and recover for their next outing faster. Similar to recommended post-exercise snacks in people, post-exercise snacks for dogs that contain a highly digestible protein with carbohydrates helps to maximally replenish the body’s glycogen stores. (These are the primary internal source for energy in an active athlete!) Consumed within 90 minutes of a vigorous exercise session, they help re-energize your dog for your next few miles together. For long trips, the big question I get frequently is “how much food does my dog need?” Of course, there are breed variations. Taller or longer-limbed dogs use less energy than their shorter legged cousins. On average, the calories needed for a dog engaging in an endurance-type activity are 0.8 calories per pound per mile traveled. For a 50-pound dog on an 8-mile hike, this means he needs an extra 320 calories on top of his regular caloric intake for that day. Of course, for shorter excursions, extra food is not necessary. Fun fact: A Siberian Husky pulling a sled in a long-distance race like the Iditarod can burn up to 8 times his normal metabolic rate, or approximately 7,000 calories a day! That’s a LOT of food. Maybe they should pack some Power Bones too just in case, eh? Watch any televised sporting event and you’ll be bombarded with advertisements of the importance of electrolyte replacement when exercising. It’s true that people can get sodium and potassium depleted during prolonged exercise, leading to muscle weakness, disorientation, irregular heartbeats, and even seizures. Interestingly, dogs are not prone to electrolyte depletion. This is mostly because they don’t lose electrolytes via sweat like humans. Supplementing electrolytes with a human product can actually lead to diarrhea and stomach upset. Additionally, supplementing vitamins (especially vitamin C) has been shown to actually reduce performance in endurance athlete dogs. They simply don’t lose the vitamins, minerals, and electrolytes like us humans. But they do lose moisture! While dogs may not lose lots of electrolytes and moisture via sweat, they do lose a fair amount of water through panting. Dog kidneys have a protective mechanism that keeps excess electrolytes from becoming too concentrated in their system as they lose water via exercise. It is critical that they are allowed to drink water during and after exercise to allow their kidneys to recirculate the needed materials throughout their bodies. If you’re out on the trails, make sure you’re aware of what type of water you’re allowing your pet to drink. A high-mountain stream near an underground spring or a fast-moving river are likely to be fairly safe, but try to avoid letting them partake in a stagnant pond or irrigation ditch. Dogs not normally exposed to the wilderness tend to be more susceptible to water-borne parasites like giardia. 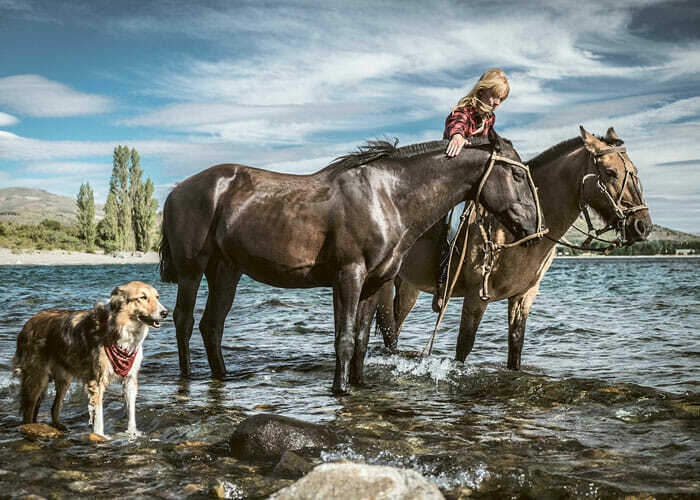 Standing water and runoff from livestock can have pesticides, herbicides, toxic algae, and even leptospira, a bacterium that causes kidney damage to you and your dog. Filter your dog’s water as well as your own if you have any doubt about the cleanliness of the water. 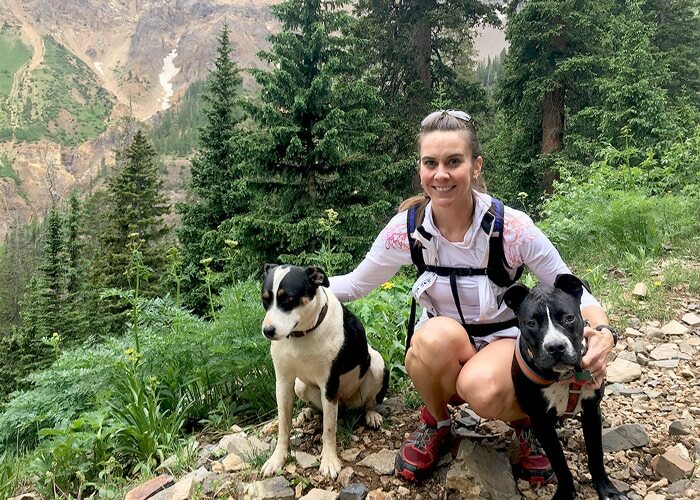 The dogs I see out on the trails of Durango seem to be experiencing pure canine joy. It makes me happy seeing people sharing the outdoors with their canine companions. I encourage you to do the same in your hometown!